QueensBuzz.com / Queens NY / June 24, 2009. 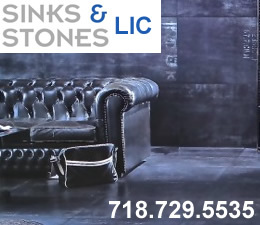 Queens is one of the oldest historical sites in the United States and the location where all kinds of great things happened. Starting back in 1657 the Vlishing Remonstrance was issued in opposition to then mayor Peter Stuyvesant's declaration barring Quakers from the town. The historic town of Vlishing [a Dutch name] was later modified to Flushing in Queens, which is an English version of the name. 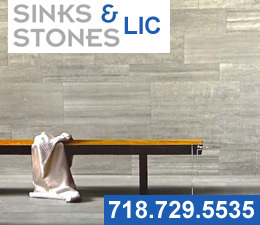 Click here to read a history of the Vlishing Remonstrance / Flushing Remonstrance. The Lent Riker Homestead in Jackson Heights still stands as one of the original homesteads of that time. 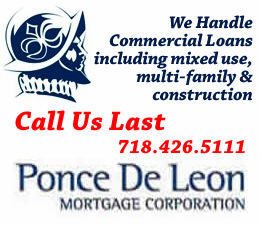 It was built in 1654 and is one of the oldest continuously inhabited dwellings in New York and the nation. Click here for a brief history on the Lent Riker Homestead. 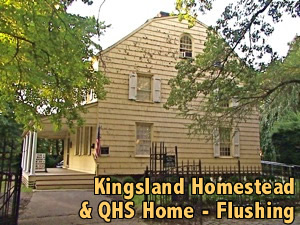 The Kingsland Homestead in Flushing is also one of the nation's oldest dwellings and is currently home to the Queens Historical Society. Eventually you'll be able to click this link to a brief history about the Kingsland Homestead and the Queens Historical Society. Queens was also once home to Rufus King, who was one of the first U.S. Senate's members, as well as an outspoken opponent of slavery and signer of the Constitution. His home, King Manor, continues to stand as a landmark in the borough in the Jamaica section of Queens. 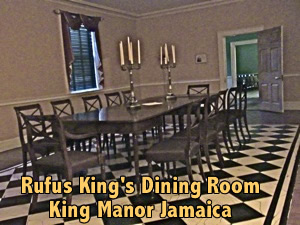 Click this link to read a brief history on Rufus King and King Manor in Jamaica Queens. At the Greater Astoria Historical Society, there's also a door on display with an arrow mark in it made by a British soldier indicating that the Queens house to which it was once attached was being confiscated by the occupation troops during the Revolutionary War. Click this link to read more about the Greater Astoria Historical Society and the Blackwell Door. 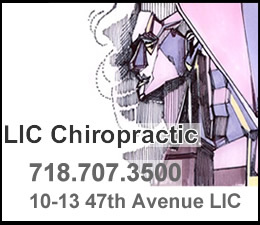 During the 1800's Manhattan became the locus and focus of the nation's attention. Queens was basically comprised of farms and pastures during this century, with some exception to be made along the East River front where some manufacturing took place. Perhaps the most notable manufacturer of the time was the Steinway Piano Factory which was once a major thriving enterprise and a sort of 'new media' musical / theatrical entity. 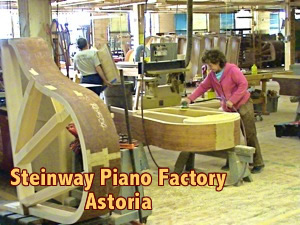 Click this link to read a story about the Steinway Piano Factory in Astoria. The Waterfront Crabhouse was also an institution of the time and re-opened for business in June of 2009 following a fire the prior winter. 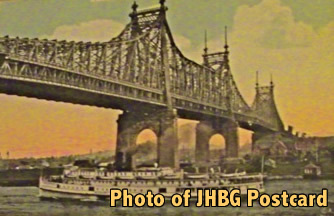 With the advent of the new century, and the installation of the Queensboro Bridge in 1909, Queens life began its transformation from an idyllic rural area, protected from Manhattan by the East River, into a suburban hotspot beginning in the early decades of the 1900's. At the close of the nineteenth century and into the beginning of the twentieth, Jamaica Queens was a major transportation hub of the Long Island Railroad. The destination and terminal went through many changes, but remains today as Queens busiest transportation hubs, as it serves as a major subway terminal, a major train terminal and a connecting point to JFK for public transit. Click here to read a brief story about the Jamaica Subway and Train Terminal. In 1906 the Cord Meyer Development Company gave Forest Hills Gardens its name. From 1910 to 1912, Margaret Slocum Sage, a widow of a wealthy financier developed the area based on an English Tudor style architecture, after abandoning a plan to provide low income housing. Quite a turnabout, but I suppose not surprising. This likely stimulated others to start planning their own communities / developments, which as you'll see many did, while adding a bit of their own personal tastes to it. It's also worth noting that the Forest Hills Tennis Club served as the first site of the U.S. Open which is now run out of the Arthur Ashe Stadium in Flushing Meadows Corona Park. Click here for a very brief story on the West Side Tennis Club in Forest Hills. In the 1920's Sunnyside Gardens was developed with the support of Eleanor Roosevelt, who was the then Governor Roosevelt's wife. The development, which was recently landmarked, was a working class development designed based on an english gardens concept. Sunnyside Gardens Park was first considered as part of the development but evolved separately alongside it. 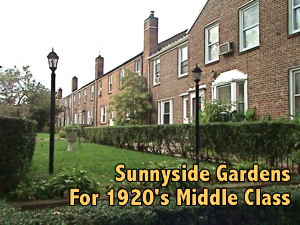 Click here to read a very brief history on the landmarking of historic Sunnyside Gardens and eventually you'll be able to click here to read a brief history on Sunnyside Gardens Park. 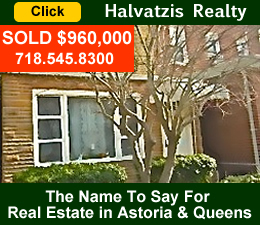 In the twenties and thirties Jackson Heights was developed as a sort of planned community under the auspices of the Queensboro Corporation which had purchased large tracts of the land for real estate development. From the mid teens well into the 1930's they developed and built many of the great apartment complexes that still stand today. Many of them contain 'garden' space, which was communal green space frequently located within the walls of the building. 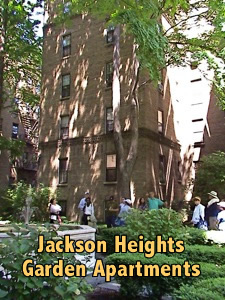 Click here to read a brief history of the development of Jackson Heights garden apartments. Queens has been the home to many greats and many great events. A few of them include many of the jazz legends including Louis Armstrong, Bix Biederbecke, Billie Holiday, Ella Fitzgerald, Count Basie, John Coltrane, Benny Goodman, Woody Herman and Glenn Miller. If that doesn't impress you - nothing will. Many lived in Corona and Addsleigh Park. Kind of cool, yeah? 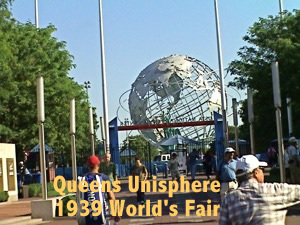 Queens was the home to the 1939 World's Fair in the Flushing Corona Meadows Park where the Unisphere, built for the fair, still stands today. Adjacent to the Unisphere is the Queens Museum Of Art which was the first site of the United Nations, following the Second World War. Click here to view one of many stories on an art exhibit at the historic Queens Museum Of Art in Flushing. During the fifties inhabitants of Queens began migrating out onto Long Island, leaving urban destinations in order to puchase their own homes. The Jackson Heights golf course eventually succumbed to development and as people vacated Queens and the racial unrest heated up, urban decay began. But as Queens history shows us, there's a continual cycle of reinvention and renewal. 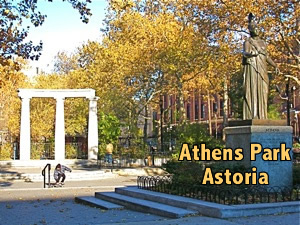 In the sixties and seventies the Greeks entered Astoria in waves. Jamaica first devolved in the sixties and seventies and then evolved in the nineties and this decade to became an African American mecca. 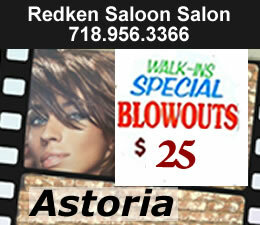 Indians, Pakistanis, and Latin Americans came in droves during the 1980's and 1990's into Jackson Heights. Sunnyside and Woodside, which one could easily have called 'Little Ireland' a few decades ago, is largely a mixed community. Actually, these days, most of Queens is very, very mixed. In fact 49.6% of the citizens of Queens come from another country. And based on my own, unscientific survey, there is another kind of 'immigrant' class, into which I myself fall, and that is immigrants from other cities or states across the country. And by that measure far more than 50% of us are from somewhere else. 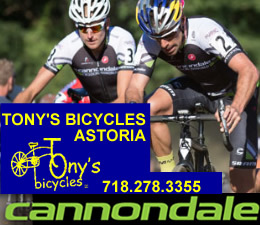 Click here to the Queens History section of the events calendar containing current events and attractions being hosted by historical sites or societies in Queens NY. 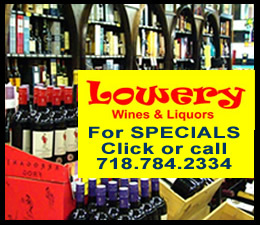 And at any time please use the search function to look for anything you're looking for in Queens NY and its related communities. Queens Buzz Site Search Tips. To find restaurants, shopping or other things to do in any of the neighborhoods, use the search function: 1) for best results, when typing in more than one word, use quotation marks - eg "Astoria Park" and 2) try both singular and plural when searching for a specific item such as "gym" or "gyms".